On 29th August 2018, Bank Negara Malaysia (BNM) has released a new update for illegal Investment Company which are neither authorised nor approved under the relevant laws and regulations administered by BNM. The list only serves as a guide to members of the public based on information and queries received by BNM. Most of the company in the list are Illegal Foreign Exchange Trading Scheme and Illegal gold investment company. 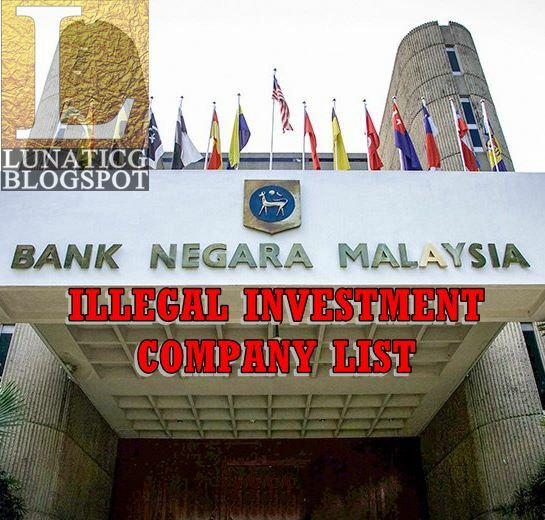 The company/individual listed as illegal because they're not an authorised dealer or has not obtained the permission of the Controller of Foreign Exchange under the Exchange Control Act 1953 (ECA). It is also illegal to trade foreign currency by a resident who is not an authorised dealer, with a person outside Malaysia, or by a resident who has not obtained the permission of the Controller of Foreign Exchange under the ECA. 268. OLTA Capital Management Inc.